Michael Stephenson, that child star of Troll 2 who directed one of the best documentaries I've seen in years, Best Worst Movie, has announced he will direct his first feature film. 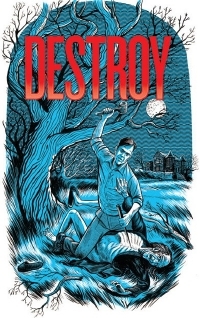 It's called Destroy, and it's about a world where vampires DON'T exist, but that doesn't stop a would-be vampire hunter named Steve Howard from leaving a trail of blood-splattered wooden staked victims across Bavaria. STYD, who reported the news, say that Destroy's tone "lands it somewhere between '80s genre classics like An American Werewolf in London and contemporary comedies like Shaun of the Dead." To me it sounds like Bill Paxton's directorial debut Frailty about a father who is convinced there are demons in the world and takes his two young boys on a killing spree. Good flick. The script is written by Alamo Drafthouse lead programmer Zack Carlson and Bryan Connolly, recent co-authors of the the amazing new book "Destroy All Movies: The Complete Guide to Punks on Film."